Intuition, inference and Inside the Spaceship (1964) | Randomwhoness: a Doctor Who blog by Johnny Spandrell. Sampling stories in random order. In the info text on the DVD for this story, it says that writer David Whitaker, in a desperate attempt to fill a two episode gap in Doctor Who’s schedule, wrote this story over the course of two days and nights, barely stopping for sleep. It’s not surprising then that Inside the Spaceship is a dream-like experience, peppered with some arresting imagery but fundamentally incoherent. It’s exactly the sort of story you might come up with, working on three hours sleep a night and with only coffee, cigarettes and the fear of what your next job will be when this series ends after 13 episodes to sustain you. It’s a tease of a story. It keeps wandering down interesting paths, then retreating from them. For instance, in the first episode Barbara (Jacqueline Hill) comes up with a theory for the blackouts, memory loss and hallucinations the Ship’s crew have been experiencing. She suggests that someone or something may have infiltrated the TARDIS. This is then expanded on by Susan (Carole Ann Ford) who’s doing the whole crazed teenage girl bit, when she proposes that whatever it is could be hiding inside one of them. The whole episode hinges on this idea. 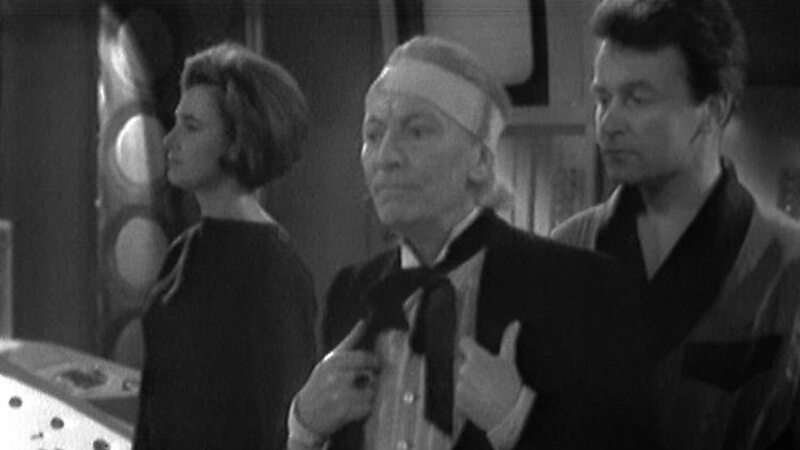 The cliffhanger, where a pair of outstretched arms close around the Doctor’s (William Hartnell) neck seems a bit stagy when you know the story well. But on first viewing I suspect it might have been quite thrilling. We know the rest of our heroes are asleep; therefore these hands must belong to the intruder. It’s not so much, “how will the Doctor get out of this one?” as “who’s in the Ship with them?” But after we find out the assailant is actually Ian (William Russell), dazedly trying to protect the Doctor, this promising plot line falls away. Another road only partially ventured down is the ruthlessness of the Doctor and what he might do to Ian and Barbara if they got in his way. The show has been building up to this; the first two Doctor Who stories both feature moments where it seems the Doctor might do something terrible about of self preservation. In the first story, there’s the suggestion that he’ll brain a wounded caveman to aid their escape, and in The Daleks, he suggests abandoning Barbara in the Dalek city when he realises the high level of radioactivity about the place. Here, having jumped erroneously to the conclusion that Ian and Barbara have attacked him and Susan and undertaken sabotage, he threatens to throw them off the Ship. Yes, the extent of his paranoia is reached. But he never goes through with the plan and events move on. What is actually happening is that the Ship is careering back through time to its own destruction, and is desperately trying to warn its inhabitants. That it would do so by knocking them out, inciting suspicion and paranoia, booby trapping the control panel, displaying cryptic photographs on the scanner and melting any available clock faces seems improbable to our 21st century understanding of smart devices. Asking why this most sophisticated of machines has to resort to an elaborate game of charades when it could simply have an error message pop up (“It seems your fast return switch is faulty and the death of everyone on board may result. Would you like me to fix that?”) is fair enough. The Ship does have a fault locator but it’s a strangely capricious box of nuts and bolts. It’s a device that can indicate if a part of the ship is faulty, but can’t communicate that despite everything working properly, the Ship is hurtling towards its doom. I don’t know about you, but I would have prioritised a code which said, “the Ship is about to disintegrate” over “the fluid link’s out of mercury” or “stock up on more bacon & egg flavoured mars bars”. Except this was a time when fantastic machines could be easily imagined, but the ways in which they might communicate with humans could not. Hence the baffling explanations given in the script to explain what the Ship’s up to. When the fault locator starts lighting up every indicator it has every 15 seconds, it suddenly all makes sense to Barbara. “We have a measure of time as long as it lasts,” she declares. “That explains the clock face. We had time taken away from us, and now it’s being given back to us, because it’s running out!” Um, what? I sense it was about 1am when Whitaker tapped out that one, probably after eschewing a fourth cup of black coffee and opening a bottle of scotch. But Barbara’s on a roll: “And it replaced time by the light on the fault locator.” Ah of course. That explains everything. She goes on: “Originally, the machine wasn’t at fault, we were. And it’s been trying to tell us so ever since!” Well she gets there in the end, but that’s some peculiarly fashioned reasoning you’ve got there Babs. But as she tells us earlier in the story, things aren’t always logical. Too true, Babs. As the story stumbles towards a close (just a few more scenes, David! Throwback that glass and keep going! ), the difference between Barbara’s approach to problem solving and the Doctor’s is presented as the crux of the story. “It was your instinct and intuition against my logic, and you succeeded… you read a story into all these things and were determined to hold on to it,” he says to her, exhibiting a bit more this story’s peculiar explanatory style. The point might have been reinforced if it was Barbara who led the Doctor to discovering the stuck fast return switch, but that task falls to the more technically minded Ian. So the triumph of instinct over logic is another one of those ideas only partially explored. The real point of Inside the Spaceship is that it marks an end to hostilities between the Doctor and his human companions. It’s a reset point, after which the Doctor will never be as ruthless again. He will throw the odd tanty but he now has a full set of willing companions. Given this outcome, it might have been better for all four crew members to have played an active role in solving the problem, reinforcing that having started out as strangers, they have ended up as a team. In short, a little more clarity of theme and a few rewrites would have helped this little stopgap story enormously. I can imagine the scene when an exhausted David Whitaker turned up to the production office, bleary eyed and unshaven, to discuss the final scripts with producer Verity Lambert. VERITY: It’s not very logical, is it? DAVID: No, it isn’t. But does it have to be? I mean, things aren’t always very logical, are they? DAVID: For god’s sake Verity, just make it! LINK TO: Utopia etc. Trouble with the TARDIS.